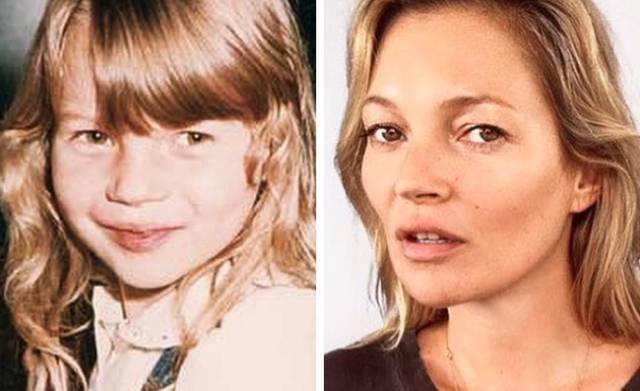 The Russian beauty that conquered the heart of Hollywood actor Bradley Cooper is not ashamed of her childhood photos. She also enjoys sharing photos of her mom and sister. And that’s all because everyone is beautiful in the Shaykhlislamovs family. This 34-year-old American actress and model got the attention of the whole world when she agreed to marry one of the most enviable bachelors: Prince Harry. 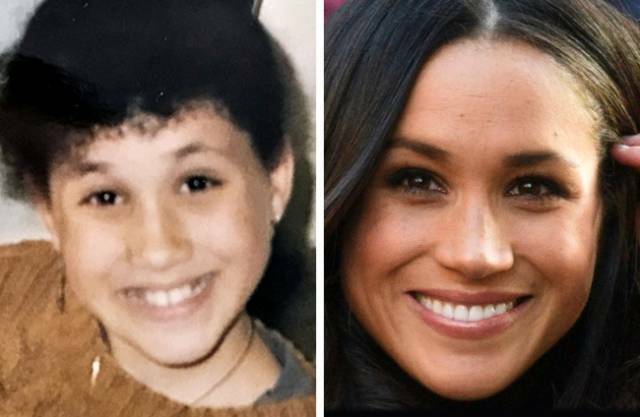 Judging by her childhood photos, Meghan is quite happy with the appearance that her parents gave her. 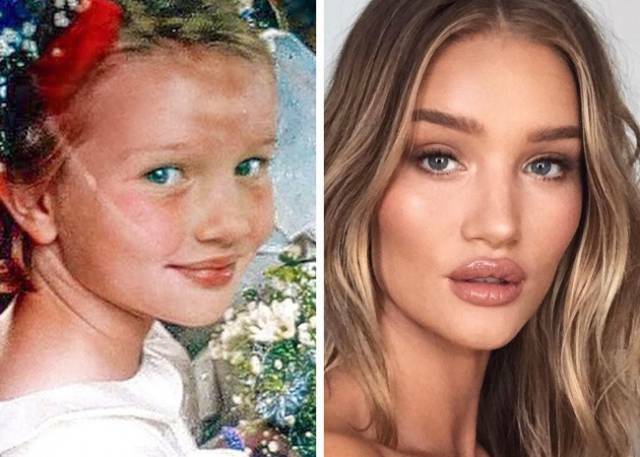 It seems that the world-famous model and holder of the “Woman of the Year” title hasn’t changed since her childhood at all, according to Glamour magazine. 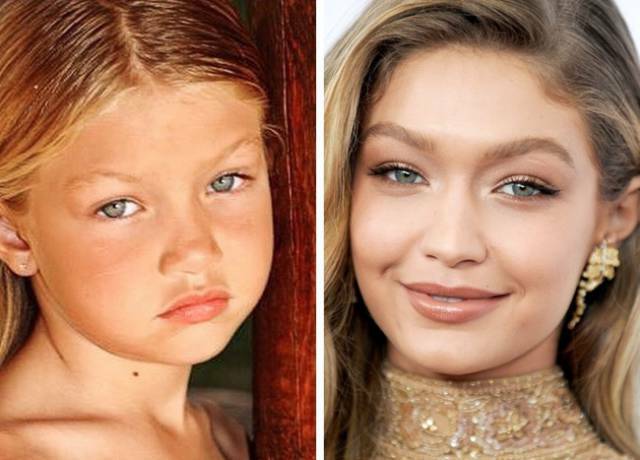 At least puffy lips and an expressive look are presents that nature gave Gigi. 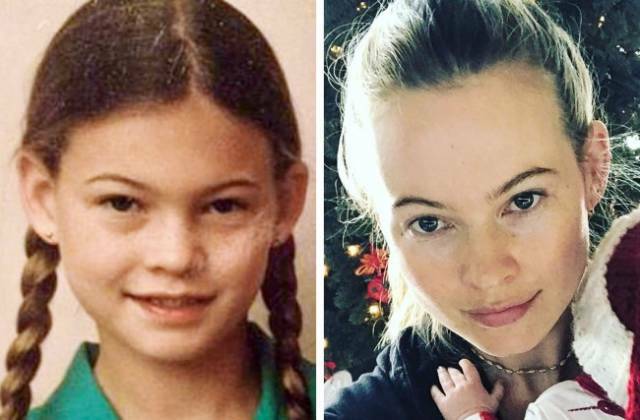 For this younger sister of Gigi and one of the most popular models in the world, the debates about her appearance never stop. 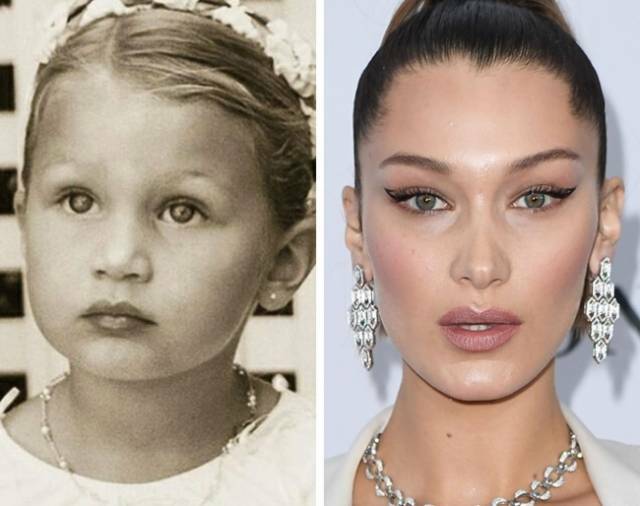 Some people claim that her face is the result of the work of plastic surgeons, but fans object that Bella’s childhood photos prove the opposite. Nevertheless, she gets multimillion-dollar contracts and works with leading fashion houses, while arguments only fuel the interest upward. 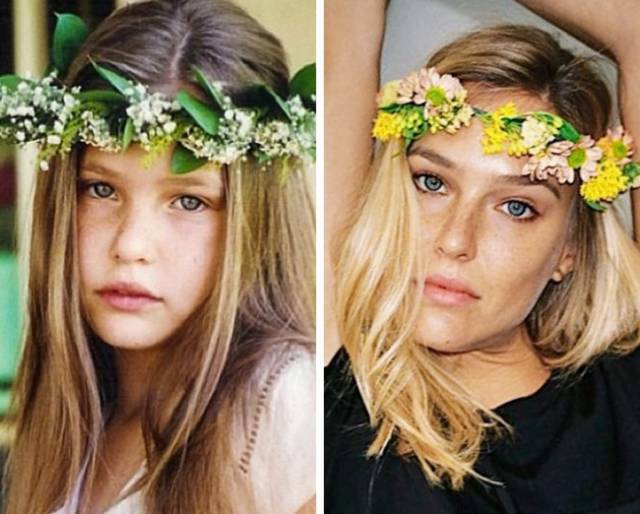 The ex-lover of Leonardo DiCaprio and a top Israeli model, Bar Refaeli does not give the slightest doubt about her natural beauty. Her life has been full of cameras, starting from the age of 8 months. And finally, why “improve” something that is already perfect? This simple girl from Namibia became a Victoria’s Secret Angel and the wife of the Maroon 5 solo man, Adam Levine. She’s not ashamed of her slightly protruding ears. Moreover, she made them her distinctive feature. Hence, plastic surgery is not the case here. This Swedish model and current Victoria’s Secret Angel has a unique appearance. But it’s not the work of a plastic surgeon. One of the most successful models in the world, Brazilian Gisele is famous for her extremely long legs. 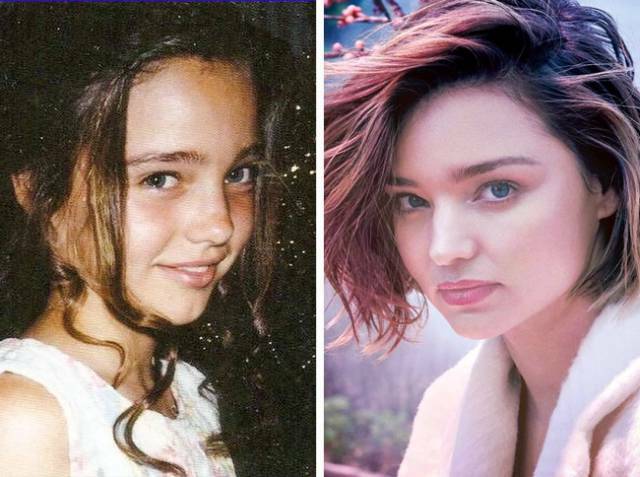 And, judging by her childhood photos, the beauty of the Victoria’s Secret Angel is totally natural. There is hardly a person who has never heard of this scandalous model of the 1990s and 2000s. Despite her anti-model height and more unusual appearance, Kate became a symbol for a whole generation. It seems she managed to create such a successful career thanks to her natural attractiveness. And a little luck. 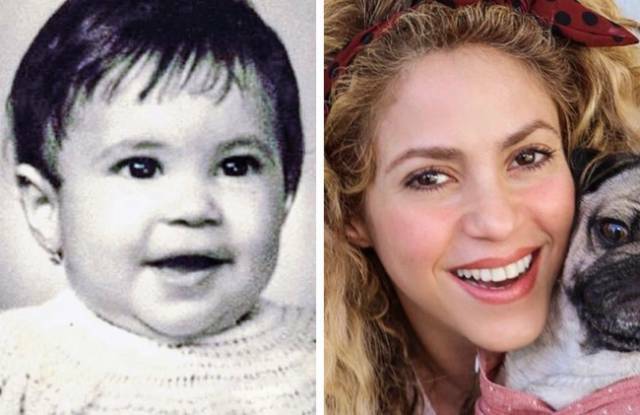 A talented singer and dancer, Shakira has changed from natural dark curls to a bright blonde and seems to have stopped here. 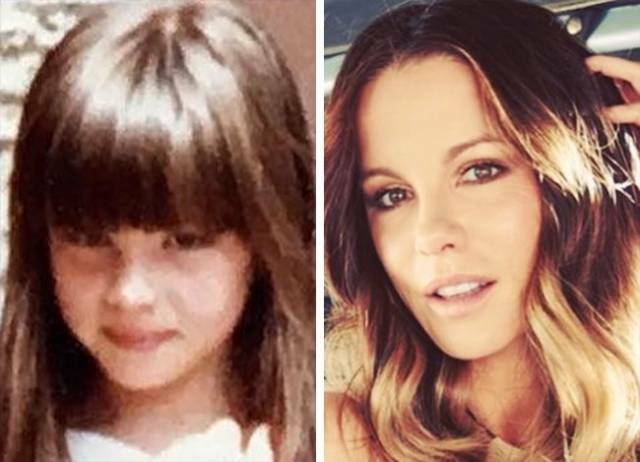 At least it is easy to recognize this Colombian beauty in her childhood photos. The Victoria’s Secret Angel and wife of Caleb Followill, the leader of the rock band Kings of Leon, not only has an ideal body shape but also very expressive eyes. We think there’s no point making any changes to such an appearance. Alessandra Ambrosio, an irreplaceable Victoria’s Secret model, can boast an excellent natural appearance that does not require the help of plastic surgeons. 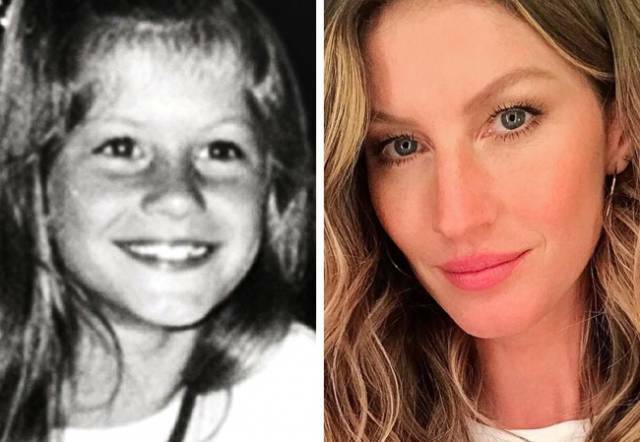 The top Australian model and Orlando Bloom’s ex-wife hasn’t changed since childhood, with the same enchanting smile and expressive eyes. These features helped her to become one of the most recognizable models in the world. The secret fantasy of many men and the beautiful vampire from Underworld is often a subject of detailed analysis of the presence of plastic surgery on her face. Kate herself doesn’t comment on those attacks and successfully continues her career. Another model whose destiny is tightly connected with the Victoria’s Secret brand. Candice also has multimillion-dollar contracts with other world-famous brands. 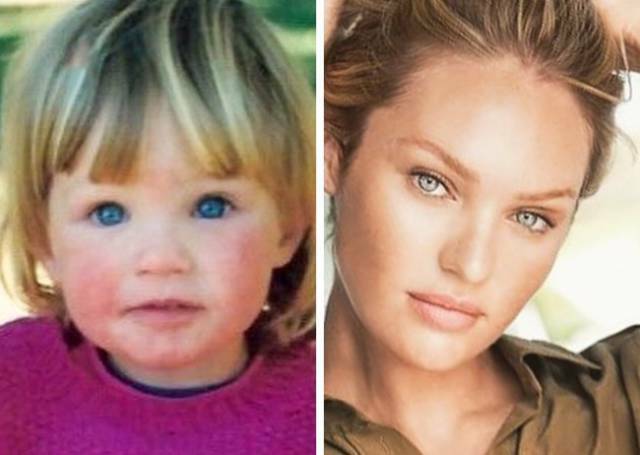 It is obvious from childhood photos of this blue-eyed beauty that her appearance is the result of winning a gene lottery. The plump lips and high cheekbones couldn’t go unnoticed even in her youth. And if we add her perfect body shape to this list, then we can easily assume that these are all the traits of her natural beauty...and that Statham is a lucky guy. 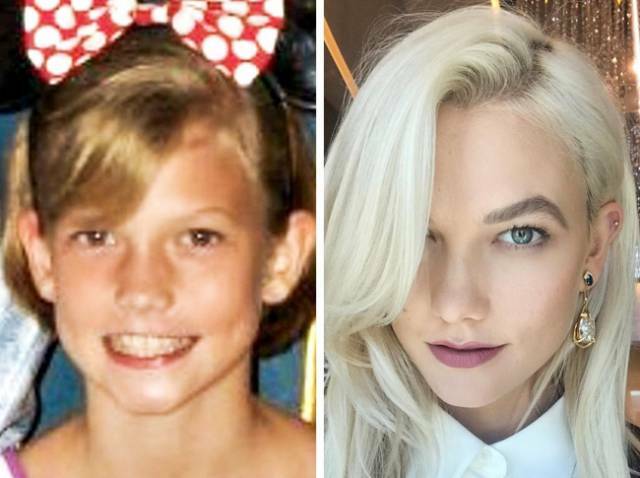 One of the most popular models in the world, a sportsgirl, and a dancer, Karlie Kloss uses only those features that nature blessed her with. It’s no surprise that many people, including Tyra Banks, call her the best model of modern times. 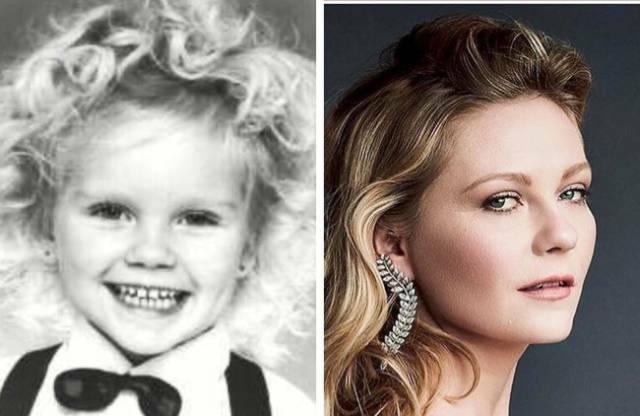 Kirsten is an actress who literally grew before our eyes. 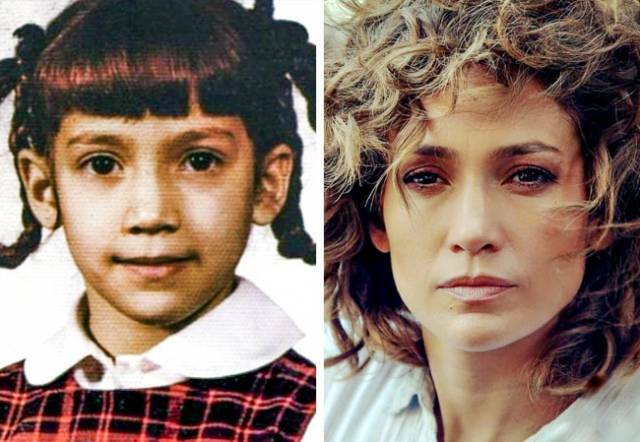 And all that is because she starred in movies in her childhood that even our children will enjoy watching (such as Jumanji). 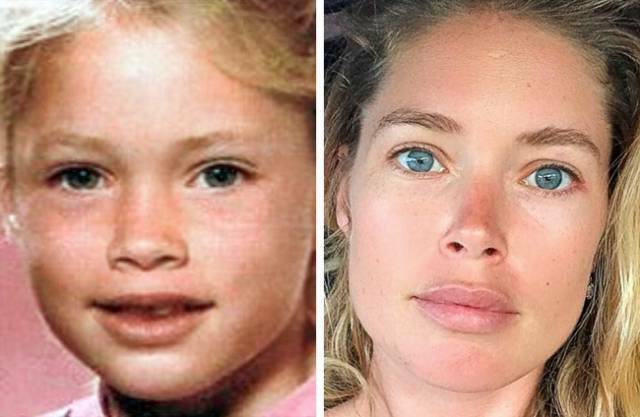 Maybe with age her look has changed, but it seems that this is all that has changed in the cute little girl who got a chance to act in a movie with Brad Pitt when she was 12. Having rapidly burst onto fashion Olympus, this British girl occupies the 5th place in the world’s ranking of supermodels. She is not afraid of changes, but she manages to keep her individuality. And if you are adored by Karl Lagerfeld, why seek the help of a plastic surgeon? Many people are familiar with the angelic appearance of this model from the Netherlands. She acts in commercials, takes part in runway shows, and recently showed herself as an actress in Wonder Woman. 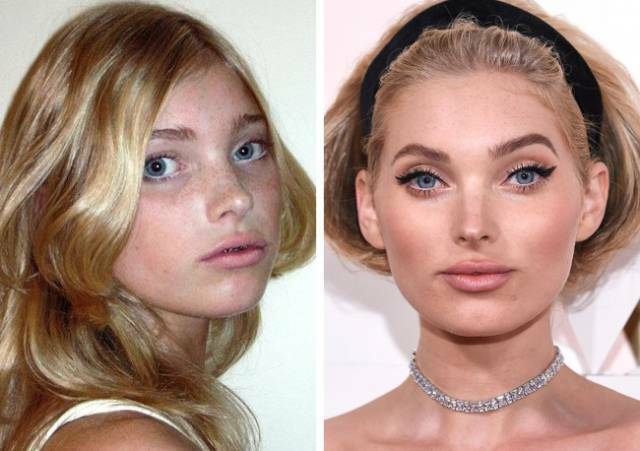 And all her childhood photos prove that improving her appearance artificially is not the case. 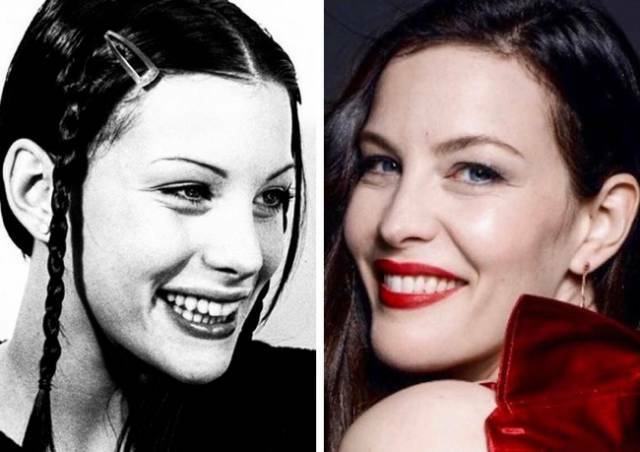 A true elf girl, Liv Tyler does not hesitate to spread her childhood photos on social media. She seems to not care about some of her imperfections. And we, in turn, love her for all her cool roles and for the video of the song “Crazy” by Aerosmith. 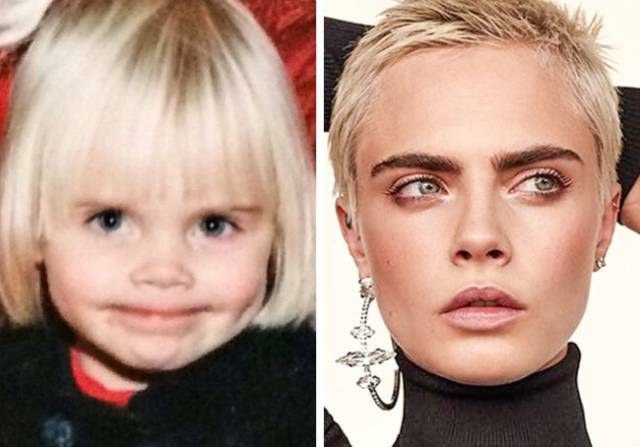 One of the greatest all-time top models was just as beautiful in her childhood as she is now. Has she ever been noticed visiting plastic surgeons? That’s something nobody knows. However, everyone remembers VHS tapes where Cindy Crawford showed the whole world how to stay fit and not waste money in gyms. Jennifer Lopez doesn’t deny that she spends a lot of energy keeping both her body and face fit. However, she never comments about whether she has ever visited a plastic surgeon. We can only guess if one can look so cool at 48 without having used the miracles of plastic surgery. Comments here are superfluous since fans and haters of this scandalous actress, director, and UN ambassador will always find arguments for and against plastic surgery. But we can forgive Angelina for anything for her gorgeous Lara Croft.